North American Aviation was the prime contractor for the Apollo Space Program. 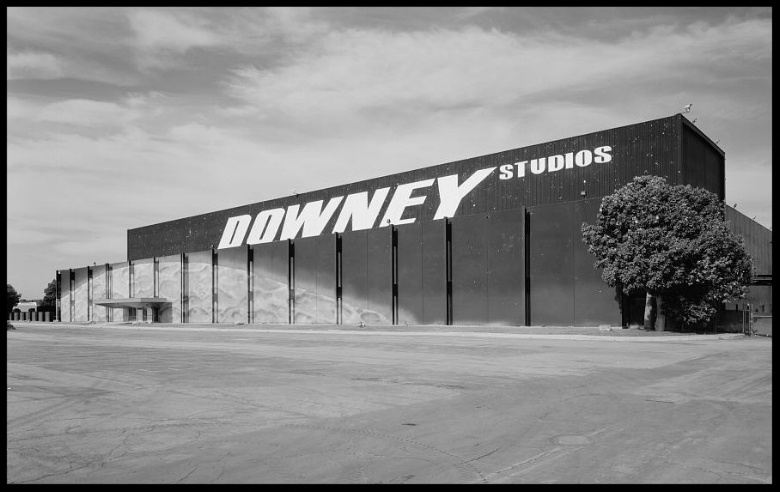 Downey's Space & Information Systems Division was the "shop" and plant where Apollo was born. Over 25,000 people worked in and around the Space Division at Downey, CA during the 1960's. Alan Shepard talking about his time on the lunar surface during the Apollo 14 mission in February 1971. Apollo in his Chariot with the hours. John Singer Sargent. National effort that enabled Astronaut Neil Armstrong to speak those words as he stepped onto the lunar surface fulfilled a dream as old as humanity. Project Apollo's goals went beyond landing Americans on the moon and returning them safely to Earth. · Establishing the technology to meet other national interests in space. · Achieving preeminence in space for the United States. · Carrying out a program of scientific exploration of the Moon. 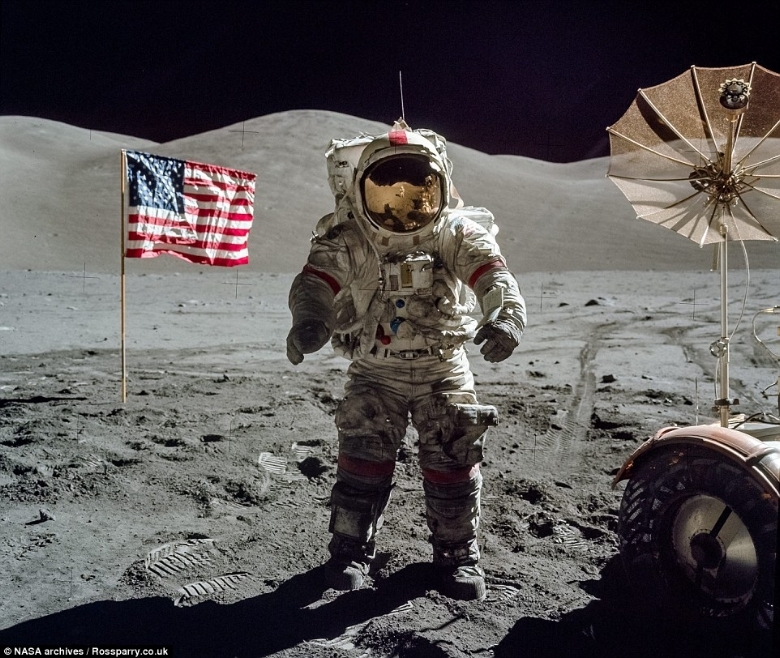 · Developing man's capability to work in the lunar environment. 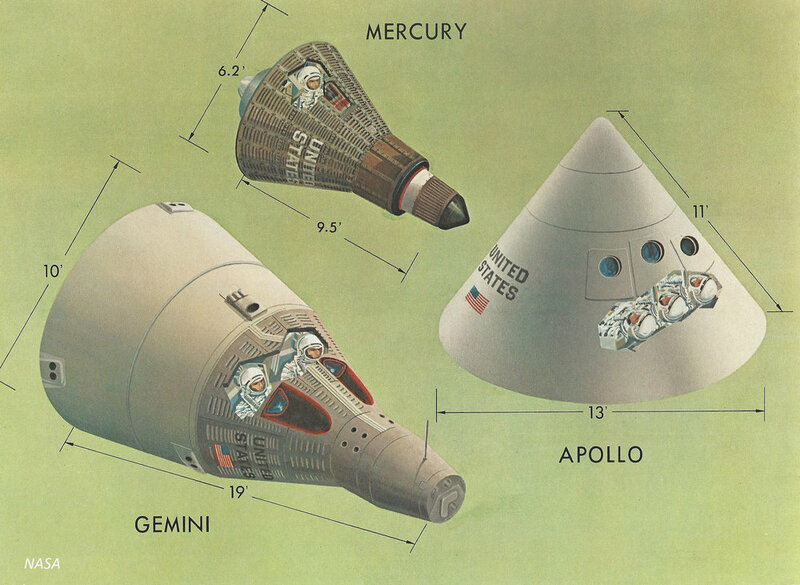 Above- NASA spacecraft comparison NASA illustration comparing boosters and spacecraft from Apollo (biggest), Gemini and Mercury (smallest). 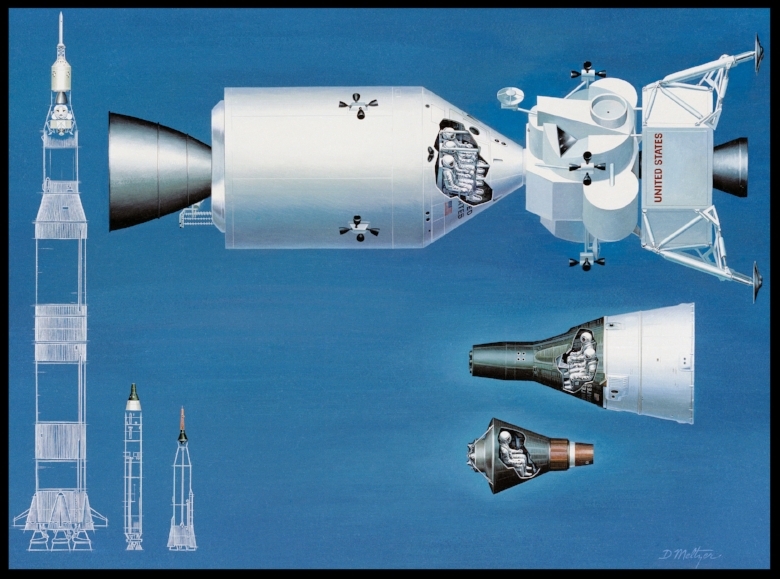 Above- Command/Service Module / Lunar Module Comparison from Apollo Training Manual "Apollo Spacecraft & Systems Familiarization"
From NASA archives- "CSM06 Command Module Overview pages 39-52"
Above- This concept is a cutaway illustration of the Lunar Module (LM) with detailed callouts. The LM was a two part spacecraft. Its lower or descent stage had the landing gear, engines, and fuel needed for the landing. When the LM blasted off the Moon, the descent stage served as the launching pad for its companion ascent stage, which was also home for the two astronauts on the surface of the Moon. The LM was full of gear with which to communicate, navigate, and rendezvous. 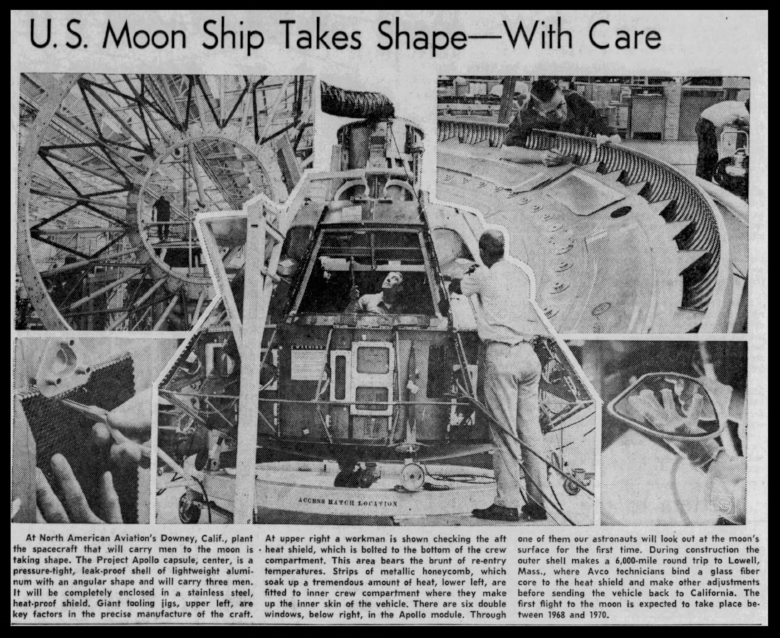 It also had its own propulsion system, and an engine to lift it off the Moon and send it on a course toward the orbiting Command Module. Above- Lift-off of the Saturn V rocket, carrying astronauts Neil Armstrong, Michael Collins, and Edwin Buzz Aldrin Jr, along with 6,700,000 pounds. Below- Apollo 11 Command and Service Module CSM-107 being assembled to the SA-506 Saturn V in the Vehicle Assembly Building, April 1969. Above- CSM-107 being assembled to the SA-506 Saturn V in the Vehicle Assembly Building, April 1969. 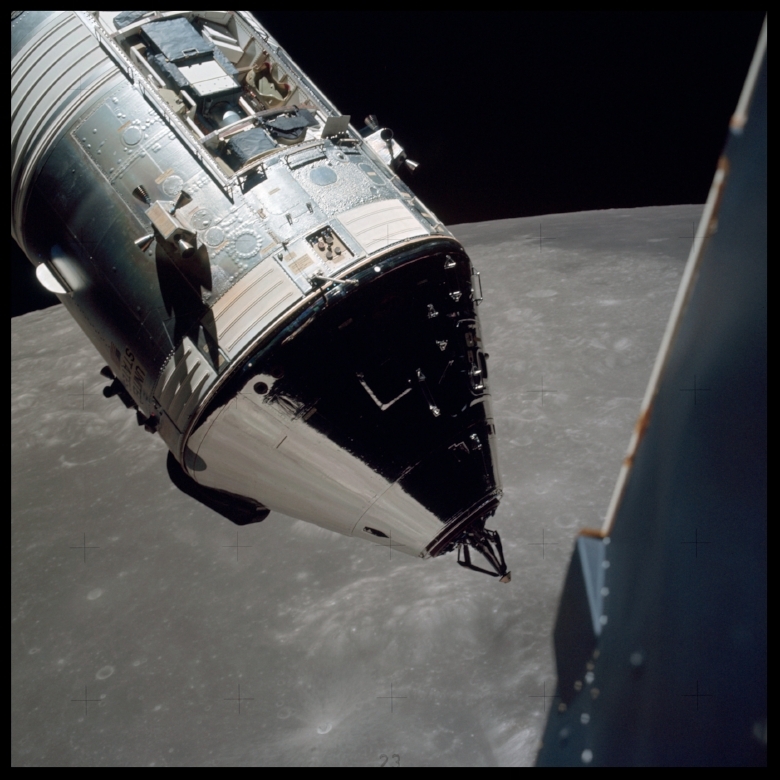 "After jettisoning the LM, the Apollo spacecraft was ready to return home. NASA used the SM's propulsion system to insert the spacecraft into a transearth injection (TEI), which means Apollo would be heading back to Earth in a trajectory that allowed for a controlled descent into the Pacific Ocean. To prepare for the return trip, the astronauts had to retrieve the launch couch and reinstall it for landing. Just before re-entry into the Earth's atmosphere, the astronauts jettis­oned the service module from the command module. The CM then adjusted its attitude -- or orientation respective to the Earth's surface -- using its thrusters so that the base of the module faced towards the Earth's surface. The information gathered by the astronauts during the Apollo missions has become invaluable to NASA and scientific knowledge in general. In the future, NASA hopes not only to return to the moon, but also build a lunar station where people can study the moon during extensive stays." Apollo capsule. The La Crosse Tribune Fri Apr 5 1963 . It Was the Thousands of Employees at Southern California's Many Aerospace Companies Who Put . . .
Dale Myers was an example of the loyalty and dedication North American Aviation embodied. "In 1963, Dale worked for what had become Rockwell International, and the following year he began to contract work for NASA's space program. 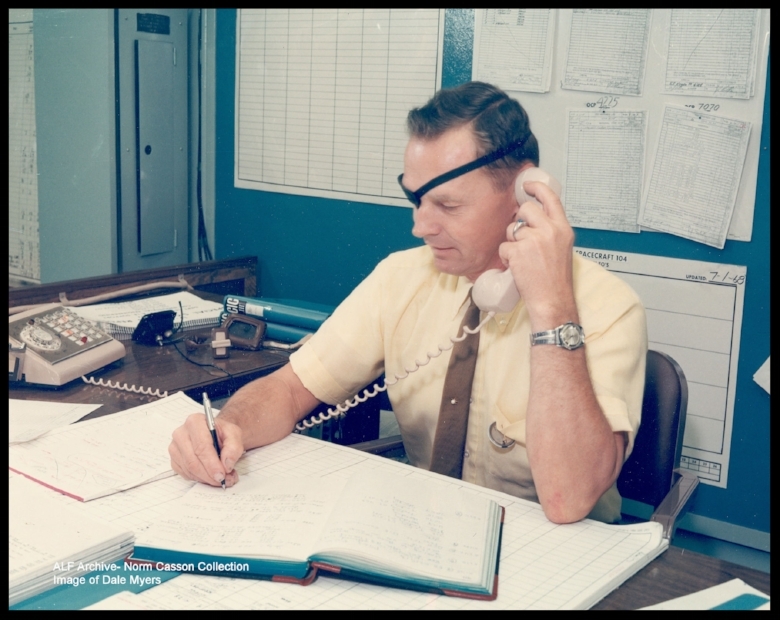 From 1964, he was the Program Manager of the Apollo program's Command/ Service Module Program. After a fire destroyed Apollo 1 in 1967, much of the program's management was discharged; Dale, however, was retained. During his four-year tenure, NASA nearly lost and then rescued a stricken spacecraft, the mission profiled in Ron Howard's 1995 film, "Apollo 13." His teams also sent four more missions to the moon and launched Skylab, America's first space station. NASA also orchestrated the meeting of US and Russian astronauts in space with the Apollo-Soyuz mission." NASA trusted Casson with the responsibility to thoroughly test and checkout every NASA manned spacecraft and take it through testing, and mission rehearsal with the actual astronaut crew members. After proving himself capable of managing Station C of the state-of-the-art Building 290 (constructed specifically for these operations), he was eventually given the responsibility of managing all Technicians, the Test Procedure Writing engineers, four control rooms, tank farm fluid and cas facilities, the systems engineers, the senior engineering test project managers, as well as all clerical and operations support personnel and the Apollo Post Recover operation and budget. This last was a team of engineers and technicians required to travel to the “splashdown” area of all Apollo Spacecraft returning from space, to save the systems and take steps to prevent hostile contamination from the surface of the moon. Above- Apollo 002 at Downey ready to ship to White Sands New Mexico. John Esslinger, Norm Casson and Dan Jannes. Bald Eagles Newsletter. Above- Article from The Orlando Sentinel Sun Aug 7 1966. "I uploaded this video from the DVD provided by Stan Barauskas of Aerospace Legacy Foundation Museum in the old Rockwell Plant in Downey. 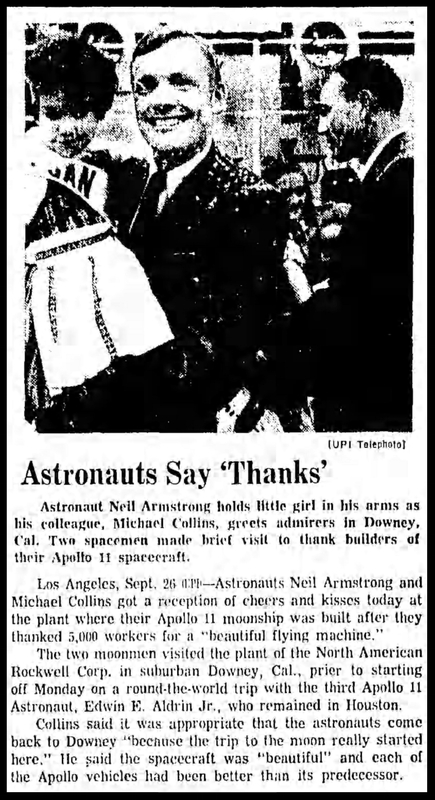 Here is the headline of "SKYWRITER", a publication of North American Aviation, dated Jan 17, 1964: DOWNEY PREMIERES LUNAR FILM Jan. 21. "With Their Eyes on The Stars", a film keynoting, the historical and importance of the nation's lunar program, will be given its local premier Tuesday night at Downey. The 22-minutes color-sound film will be shown at the Meralta Theatre, 10912 Downey Ave. Premier ceremonies will begin at 7 p.m. and will feature officials from NASA, the City of Downey, top management representatives of the division. Personal Appearance Making a personal appearance will be John Stewart of the Kingston Trio, who wrote the original folk music and lyrics for the movie. ....... I have included several stills of the newspaper at the end for you to read." Apollo crew compartment stowage review at North American, Downey, Calif., for the Apollo 9 crew training. May 2, 1968. In front of Bldg. 290 moved from NAA Downey to Long beach for transport to Kennedy Space Center. 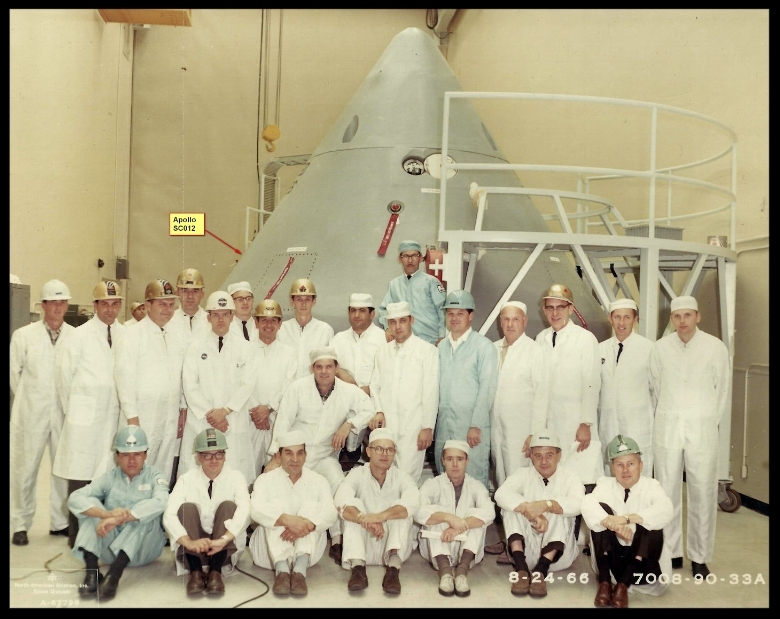 Command Module on "drop tower"
Apollo fabrication and testing at North American Aviation on Downey, California. 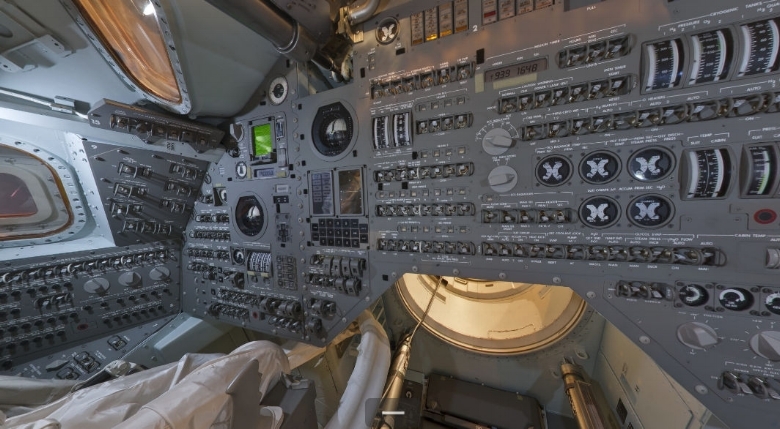 The Apollo command and service modules were built at North American Aviation's plant at Downey, California. 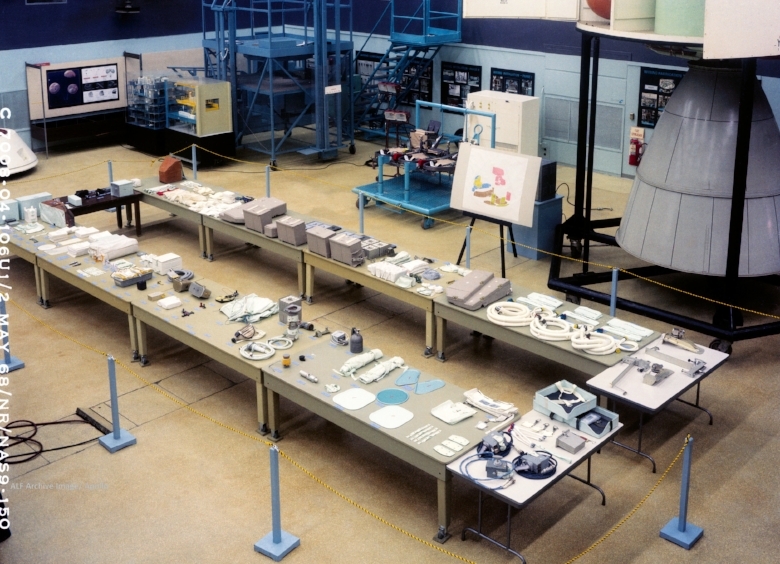 The lunar lander, in the eyes of some observers, was the most critical part of the Apollo vehicle.Apollo fabrication and testing at North American Aviation on Downey, California. The Apollo command and service modules were built at North American Aviation's plant at Downey, California. Pressure Garment Assembly, ingressing Apollo SC 101 CM during Apollo Crew Compartment Fit and Function C2F2 Test. NAA, Inc., Downey, Calif.
To accomplish this goal, NASA put out a two bids for space program contracts. The first was for the Saturn S-11, the second stage of the Saturn V Launch Vehicle designed to send multi-ton payloads into space. The second was for the Project Apollo Spacecraft Development Program, comprising the command module and service module. North American won both awards, and in so doing, made Downey the industrial center for America’s lunar space program. 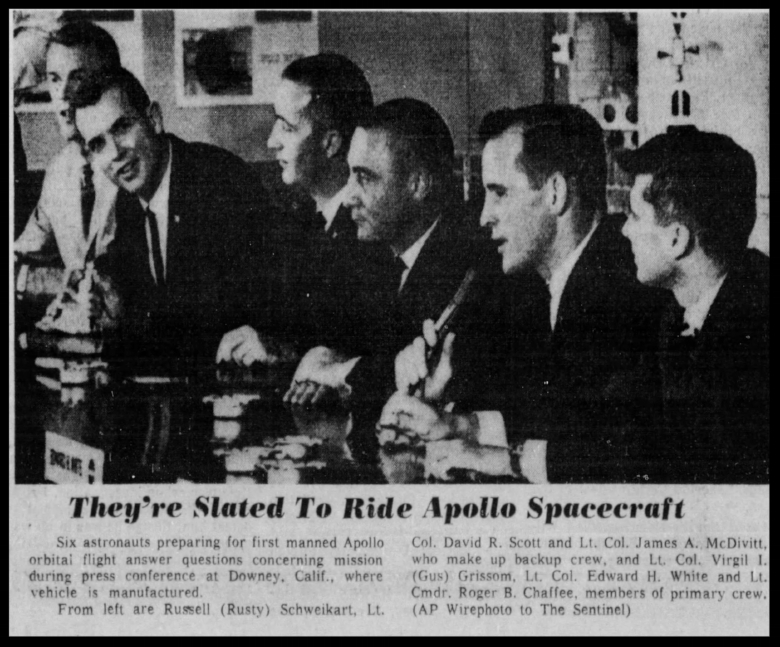 To support the Apollo program, NASA established the Resident Apollo Spacecraft Office (RASPO) at the Downey plant. During the peak of the Apollo program, the number of resident government and support contract personnel (including astronauts) was over 300. 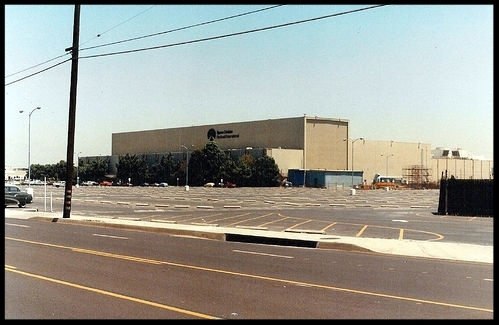 North American Aviation plant in Downey, California. April, 1961. Apollo Program Impact Test Tower at North American Aviation Space Divisionl in Downey, CA. Astronaut Virgil I. Grissom and other members of the first Apollo crew inspect spacecraft equipment during a visit to North American Aviation. NORTH AMERICAN AVIATION, INC., DOWNEY, CA , June 24, 1966. Apollo 11 Command Module (CM-107) during construction and testing at the Rockwell plant in Downey, California. Above- The Apollo 11 command module, no. 107, under construction and testing in 1968 at North American Aviation's factory in Downey, California. 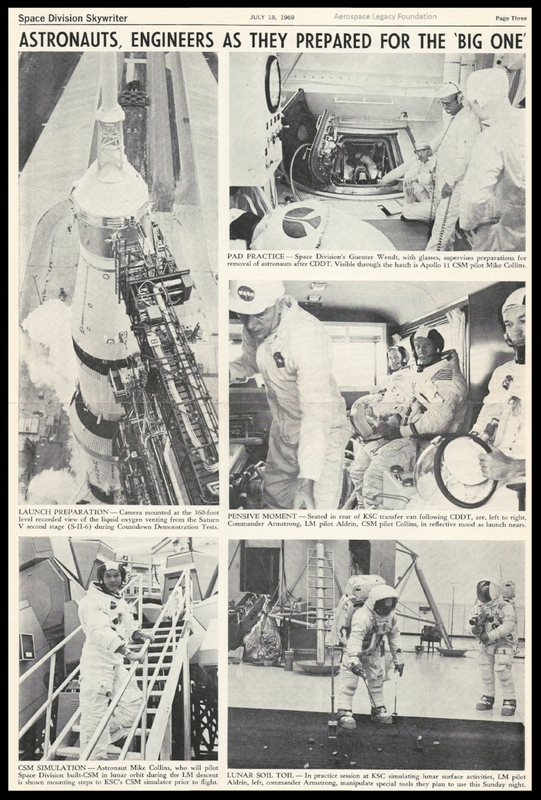 North American Rockwell News Apollo 11. The Space Division Skywriter. ‘The Eagle Has Landed’ proclaims the front page of The Washington Post on July 21, 1969. Photograph taken by Jack Weir of his daughter. Photograph taken from the Apollo 11 spacecraft during its translunar coast toward the moon. Apollo 11 was already 98,000 nautical miles from Earth made on July 17th, 1969. 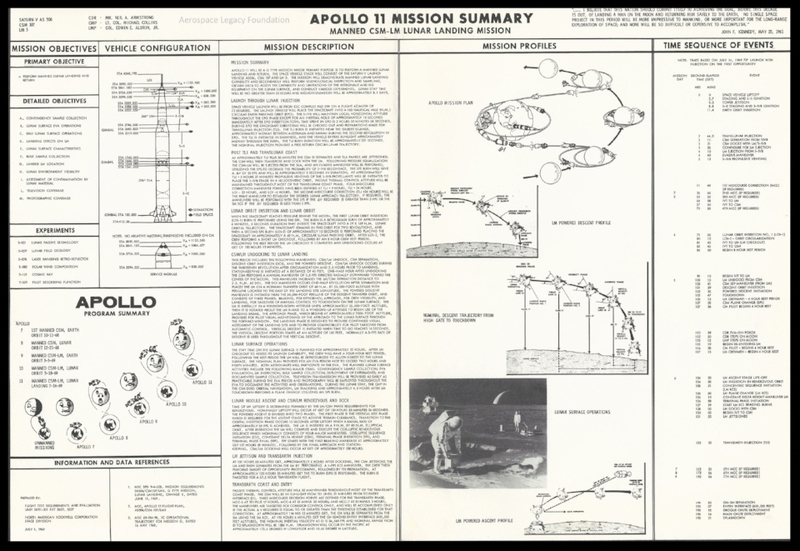 Apollo 11 Mission Summary Courtesy Harold Orland. Click here for full image. North American Aviation Space Division Skywriter, July 18, 1969. For more click here. "Say this about the flight of Apollo 13: The spashdown, which occurred 40 years ago today, was perfect. That's not just because the crew actually managed a splashdown, as opposed to bouncing off the atmosphere or burning up on reentry. It's because the maneuver was executed so deftly. The conical Apollo command modules were deliberately hung crookedly from their parachutes so that the ship wouldn't slap into on the water on its blunt bottom, but would instead knife into it. That didn't always happen, since the craft could still catch a nasty wave as it hit. But Apollo 13 caught no wave and slipped into the ocean with almost balletic ease — the only thing about the mission that went just right." "More than twenty years after the first manned landing on the moon, President Kennedy's commitment to the lunar mission sounds as bold as it ever did: American astronauts should fly a quarter of a million miles, make a pinpoint landing on a strange planet, blast off it and return home safely after an eight-day voyage through space. 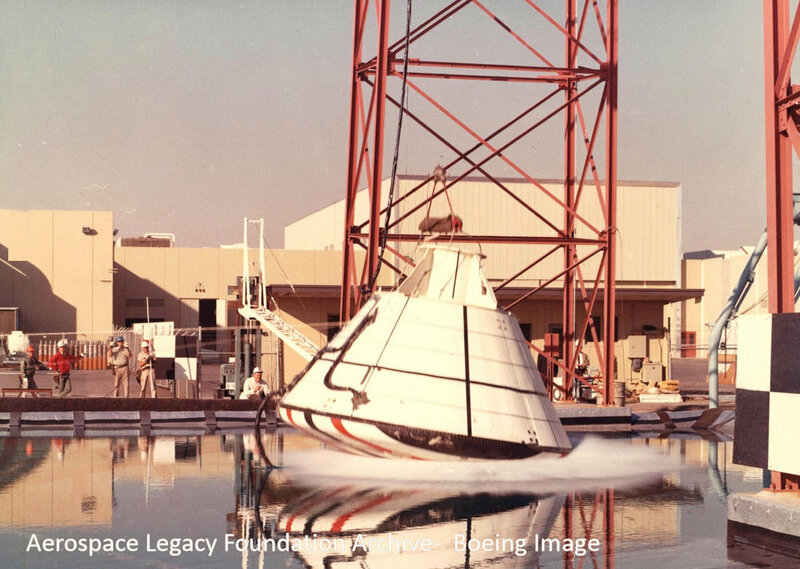 When Kennedy challenged the nation to risk this incredible journey, the only United States manned spaceflight up to that time had been Alan B. Shepard's 15-minute suborbital excursion in Mercury capsule, Freedom 7. NASA was not exactly sure how the lunar mission should be made at all, let alone achieved in less than ten years' time. Answering President Kennedy's challenge and landing men on the moon by 1969 required the most sudden burst of technological creativity, and the largest commitment of resources ($24 billion), ever made by any nation in peacetime. At its peak, the Apollo program employed 400,000 Americans and required the support of over 20,000 industrial firms and universities. In the opinion of many space historians, NASA Langley's most important contribution to the Apollo Program was its development of the lunar-orbit rendezvous (LOR) concept. The brainchild of a few true believers at Langley, LOR's basic premise was to fire an assembly of three spacecraft into Earth orbit on top of a single powerful rocket. "The basic premise of LOR was to fire an assembly of three spacecraft into Earth orbit on top of a single powerful rocket (the Saturn V). With the Apollo spacecraft, the Saturn V stood 363 feet tall. Pictured is the launch of Apollo 11, the first mission to land men on the moon, on July 16, 1969". More here on Lunar Orbit Rendezvous, "Enchanted Rendezvous"
"When the United States set a goal of landing a man on the moon, NASA Langley Research Center tackled the many challenges of spaceflight, trained astronauts, managed Project Mercury, and assumed major roles in both the Gemini and Apollo programs. Langley led the Lunar Orbiter initiative, which not only mapped the moon, but chose the spot for the first human landing. Langley aerospace engineer John Houbolt championed the lunar-orbit rendezvous concept, enabling the Apollo 11 moon landing and the safe return of its crew to Earth. Neil Armstrong, the first human to set foot on the lunar surface, trained at Langley's Lunar Landing Research Facility on equipment that cancelled all but one-sixth of Earth's gravitational force to match that of the moon's. This photograph shows Armstrong at the Lunar Landing Research Facility on Feb. 12, 1969. Twenty-four astronauts practiced touchdowns at the facility, where overhead cables supported ﬁve-sixths of the weight of a full-size model lander, and thrust was provided by a working rocket engine. Part of the landing facility was the Reduced Gravity Simulator, which was attached to an overhead, lightweight trolley track. 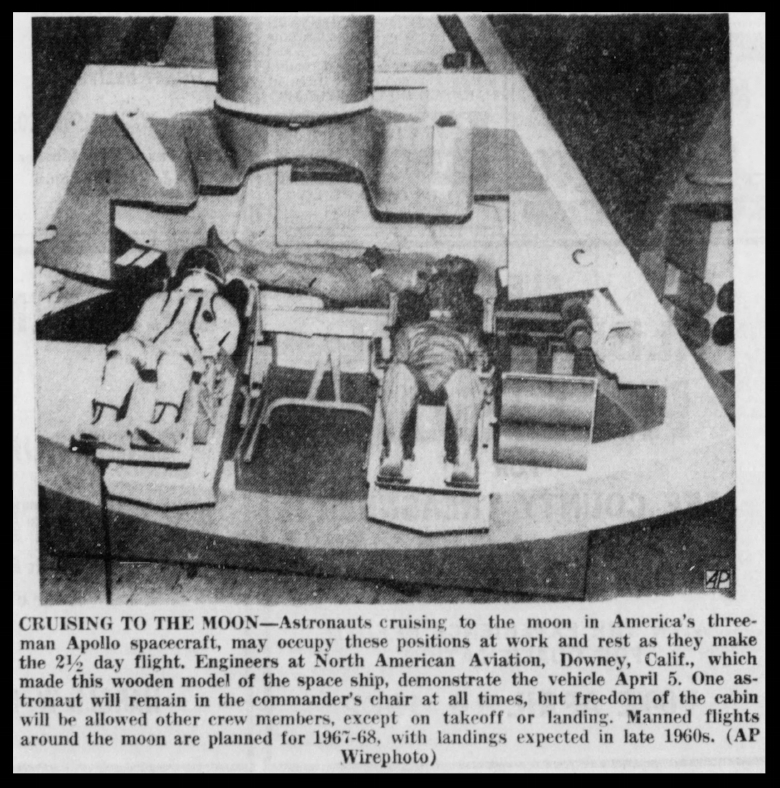 There, suspended on one side by a network of slings and cables, an astronaut's ability to walk, run, and perform the various tasks required during lunar excursions was evaluated. 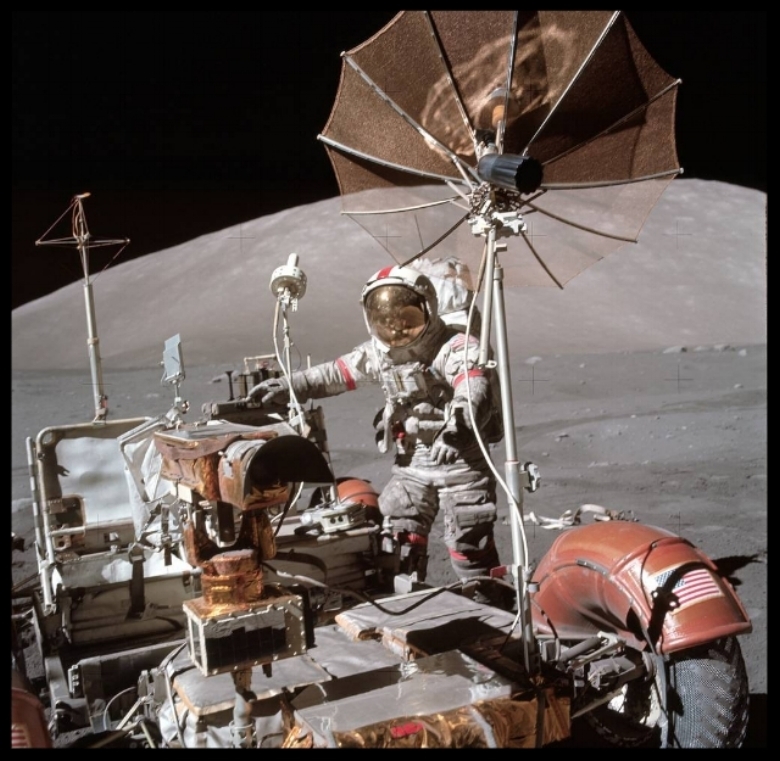 "Ames researchers quietly contributed to the Apollo mission. Public attention focused on the spectacular—powerful rockets, massive spaceports, mission control centers, and charismatic astronauts. Ames hosted none of these spectacles. Perhaps the most exciting photographs to emerge from that era, around Ames, were of tiny capsule models ablaze in a high-speed ballistic range or a high-temperature arc jet tunnel. Instead, behind the scenes, Ames researchers gathered knowledge about new scientific fields that needed to be known and tested their technologies with painstaking precision. And they did so with a style that was uniquely Ames. Researchers with many areas of expertise discussed their work persistently and freely, then cooperated to bring every tool they had to solve a very complex problem. And they were given the freedom to work quickly and to their own ideal of thoroughness. Ames developed some key Apollo technologies, most importantly technologies to allow the astronauts to return safely to earth. 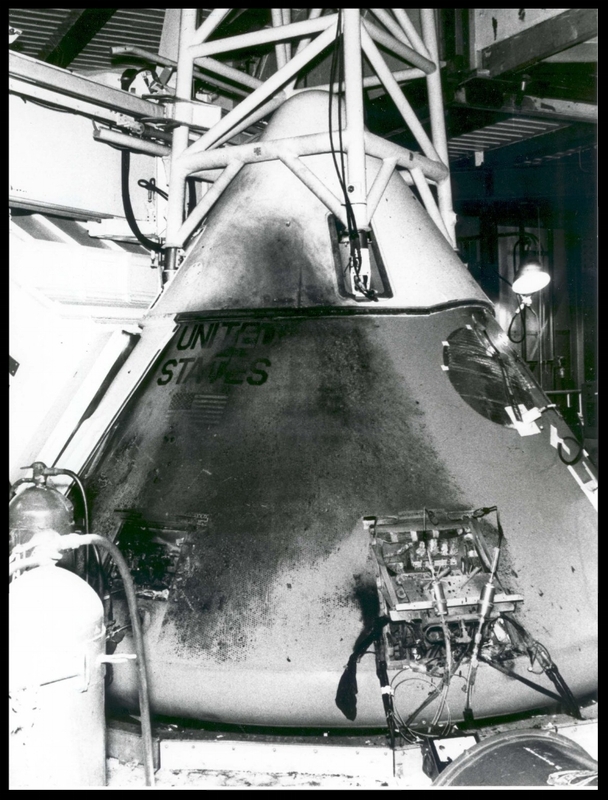 Building upon what was already two decades of research on re-entry physics and material science—a discipline today known as aerothermodynamics— NASA researchers at Ames devised the basic shape of the Apollo capsule and its thermal protection system. 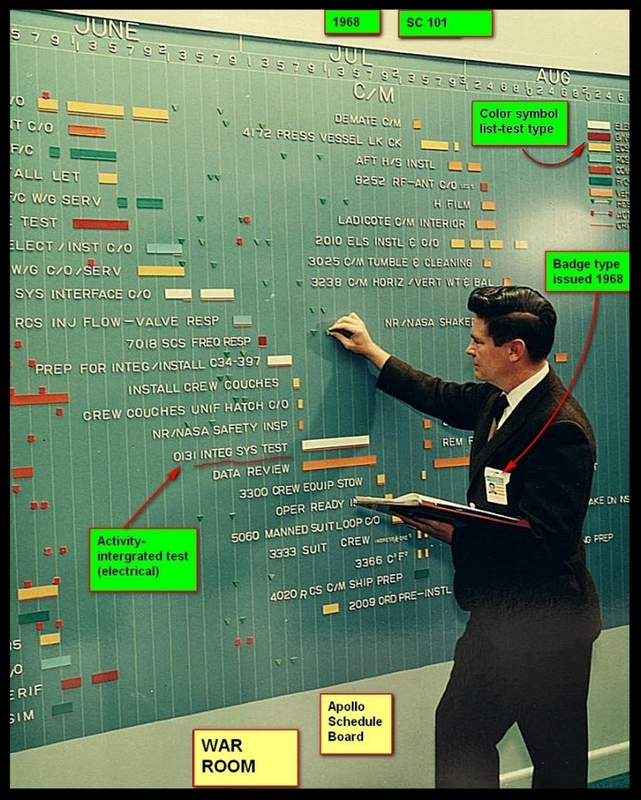 Today, almost sixty-five years later, all spacecraft are still derived from essential insights earned at Ames. "On Jan. 27, 1967, veteran astronaut Gus Grissom, first American spacewalker Ed White and rookie Roger Chaffee (left-to-right) were preparing for what was to be the first manned Apollo flight. The astronauts were sitting atop the launch pad for a pre-launch test when a fire broke out in their Apollo capsule. The investigation into the fatal accident led to major design and engineering changes, making the Apollo spacecraft safer for the coming journeys to the moon". Apollo 1 astronauts L-R in suits Ed White II, Roger Chaffee and Gus Grissom . Image- North American Aviation Space Division April 1966. "This week in 1972, the Apollo 17 crew returned to Earth following a successful 12-day mission. Apollo 17 marked the final crewed lunar landing mission. Here, Apollo 17 commander Eugene Cernan approaches the parked Lunar Roving Vehicle. NASA's Marshall Space Flight Center designed, developed and managed the production of the Lunar Roving Vehicle that astronauts used to explore the Moon. Today, Marshall is developing NASA's Space Launch System, the most powerful rocket ever built, capable of sending astronauts to the Moon, Mars and deeper into space than ever before. The NASA History Program is responsible for generating, disseminating and preserving NASA’s remarkable history and providing a comprehensive understanding of the institutional, cultural, social, political, economic, technological and scientific aspects of NASA’s activities in aeronautics and space. For more pictures like this one and to connect to NASA’s history, visit the Marshall History Program’s webpage. (NASA)"
Building 290 image from the Downey Live-wire Newspaper. Courtesy- Downey Historical Society. Apollo Building 290 North American Rockwell 4-15-1966. 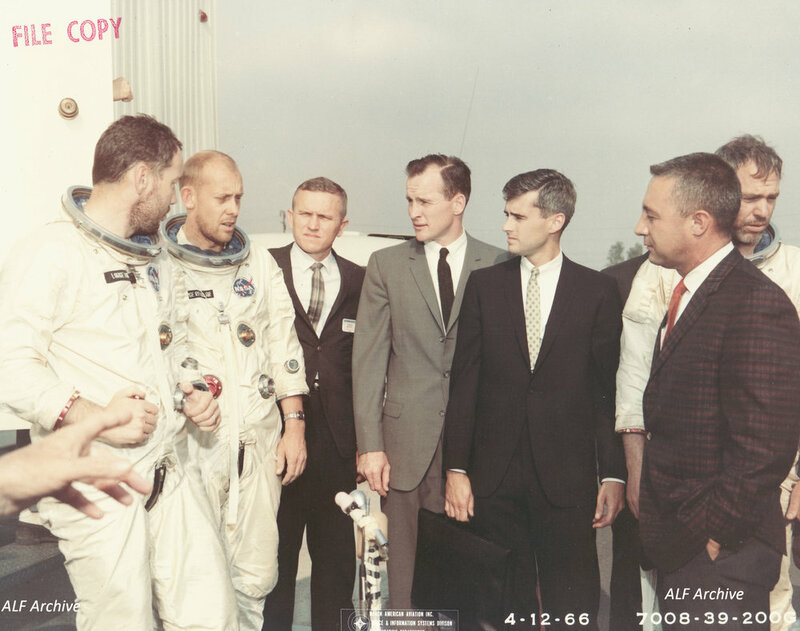 NAA Skyriter 1965- Joe Shea visits North American Aviation's Space Division at Building 290. Rockwell International's Building 290 on Lakewood Boulevard in Downey, California. Building 290 facing Gate 19 entrance. March, 2009. Latimer Images. Image- Aerospace Legacy Foundation Retiree Luncheon at Downey Studios, November 2008. Blackburn: "When we won the contract to go build Apollos, nobody had ever done that before. And so there was no book on the shelf that you went to and said here’s how you build a spacecraft. We had to start with building cardboard models. * NASA's Apollo Image Gallery- The whole ball of wax!